Rosemary Hill, BSN, CWOCN, CETN (C)1, Joshua Douglas, MD, FRCPC, ABIM2. 2Infectious Disease and Critical Care Internal Medicine, 1,2Lions Gate Hospital, Vancouver Coastal Health, North Vancouver, BC, Canada. Presented at SAWC Spring 2017. Proceedings of the Annual Symposium on Advanced Wound Care; 2017 Apr 5-9; San Diego, CA, USA. Real-time, point-of-care detection of critical bacterial colonization relies primarily on visual inspection and clinical signs and symptoms. 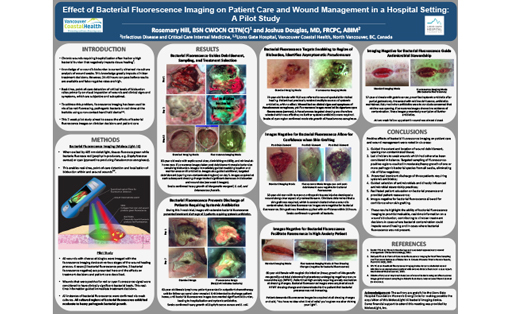 Fluorescence imaging has recently been used to detect bacterial fluorescence in wounds at the bedside.1 This pilot study aimed to assess its effects on clinician decisions and patient care. Over a 7-week period, diverse acute and chronic wounds (n=40) were imaged as part of routine wound assessments. Wounds positive for red or cyan fluorescence were considered to have clinically significant bacterial loads. Any resulting change in clinician practice or effect on patient care was noted. 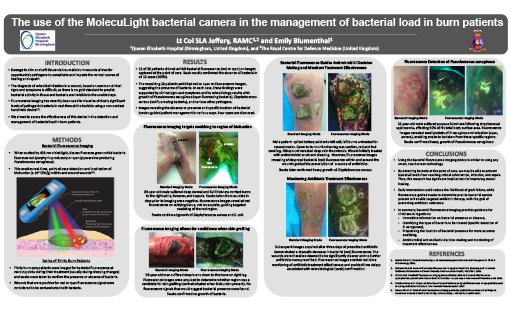 These results highlight the potential of bacterial fluorescence imaging, used in conjunction with best clinical practices, to positively impact patient care and bacterial management, guiding clinician treatment decisions at the point-of-care in cases where bacterial contamination could impede wound healing. Swanson, T. et al. International Wound Infection Institute (IWII) Wound Infection in Clinical Practice. Wounds International 2016.